Celebration, Team Building, Networking Event, Product Launch? You name it, we’ll knock it out of the park. 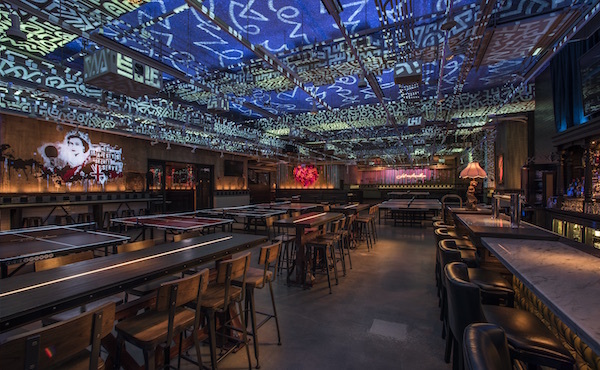 The Gallery: An edgy semi-private area with ample seating and two ping pong tables that is slightly elevated from the rest of the main floor. This space can accommodate up to 40 guests. The Garage: A VIP space, tucked away from the main area with one ping pong table (from the 2016 Rio Olympics!). This space can accommodate up to 40 guests. The Parlor: Luxurious and exclusive, it is the perfect party setting for groups of up to 100 guests. 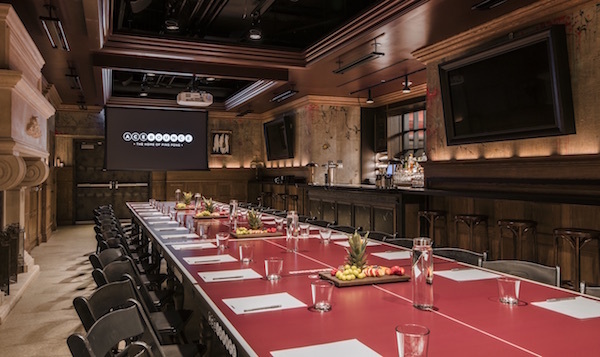 This room includes 3 ping pong tables, a private bar, and full AV capabilities. *Minimum net spend of $2,750 required. No cash value. Cannot be combined with other offers, incentives, or discounts. Must mention offer at time of booking. Discount for up to 2 hours - any additional hours at regular price. Tax and service charge on original amount. 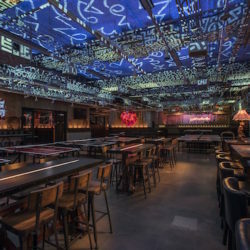 AceBounce has unique, blacklight-reactive artwork throughout the venue and in the private & semi-private spaces. 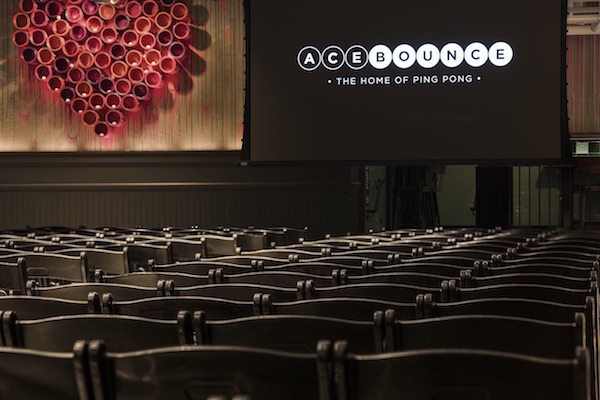 AceBounce offers an impressive food and beverage program that most wouldn't expect from an entertainment venue. 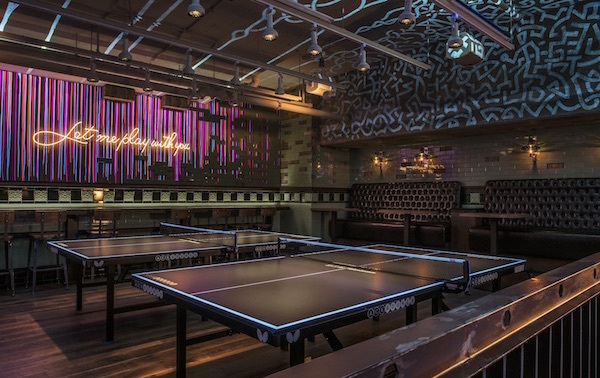 With the ability to move and adjust ping pong table locations, the venue can be molded to the needs of every individual client. AceBounce is great for getting all of your guests involved and having a great time. 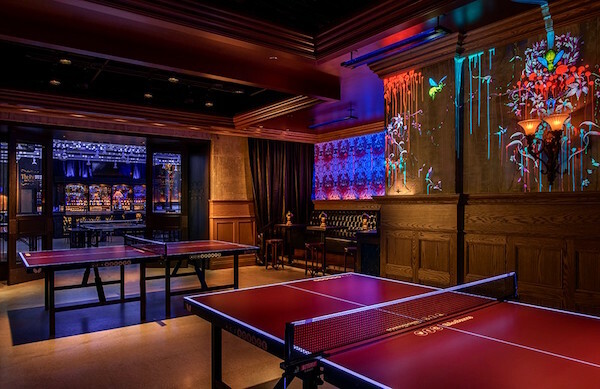 Partying around a ping pong table is a completely innovative way to have a fun night out with friends and coworkers. We offer an all-inclusive experience (food, beverage, music, gaming). AceBounce offers the option to have experts on hand to ensure all guests are enjoying their time with us to the fullest! Our "Games Gurus" organize and entertain groups with fun, innovative ping pong games designed specifically for groups. 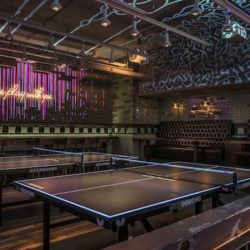 Not only does it provide a memorable experience for guests, it also relieves the pressure of hosting and entertaining your guests and will get even the most novice of ping pong players involved. 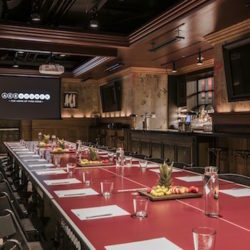 AceBounce provides a truly unique and out of the ordinary experience of socializing around a ping pong table, expertly planned by our experienced sales team. 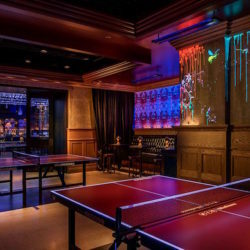 AceBounce offers a great flexibility with spaces - options to host party in the buzzing main space or something more private in the Parlor one of our semi-private areas. Uncompromising quality - award winning chef, mixologists and venue designers – to exceed all expectations. 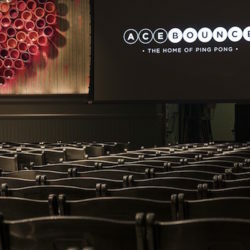 James Beard-awarded Chef Rick Gresh, that can be enjoyed within the formal setting of our restaurant nested in the buzzing AceBounce venue or casually around the ping pong table or bar. Excellent wine, craft beer and extensive cocktail list, curated by award winning mixologist Peter Vestinos. Named Best Overall Group Activity for 2017 by KAPOW Events. Listed among Chicago’s Top 10 2016 openings by Eater Chicago.